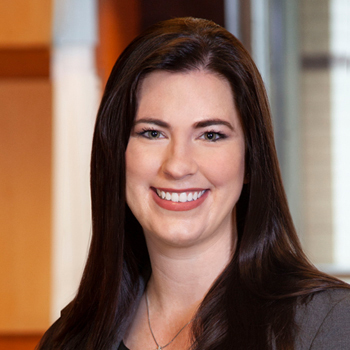 Prior to joining M. Sue Wilson Law Offices, Jamie was a law clerk in Hennepin County Family Court. Working with families in Hennepin County not only gave her the desire to practice family law, but the experience helped Jamie gain a better understanding of how to resolve complex family matters. She was able to cultivate relationships with judges and judicial staff to truly understand the thought process behind each and every decision – an invaluable experience that has helped hone Jamie’s legal skills. Jamie grew up working for her family’s small business, and also served as its legal counsel. This experience provided Jamie with a unique perspective in grasping the importance of family business and the nuances this may present during dissolution. There are no two clients that are the same, and it is Jamie’s goal to help each client not only reach, but surpass their goals. People are often unfamiliar with the court system and fear the unknown. Jamie is there to help navigate our clients through this difficult process. Jamie earned her J.D. from the University of St. Thomas School of Law, after earning a B.S. in Political Science from the University of Minnesota. Jamie enjoys spending time with family and friends, golfing, reading, and being out on the lake.